›Corporate Culture, Diagnosis, Interesting Articles, Our Blog, Rave, Talent Management›A Halloween Golden Oldie from 2015: Workplace Zombies! On the other hand, there was a full weekend before the actual day to hold parties and celebrate. Plus, at work Halloween has become quite the bonding activity, especially in offices where costumes can be worn. A little less work might get done, but relationships get a chance to deepen, which will pay off in greater collaborative outcomes over the next few months. Given all this, some might be feeling just a bit of extra stress. So, we thought we might insert a little humor into your Halloween hustle to give you a chance to smile. Find below a slideshow from a software company called Workfront, who put together a wonderfully creative take on actual customer survey results about employee engagement two years ago. The creators gave all the data and “personality types” a fun, ghoulish spin for the holiday, putting a “zombie” spin on all the types of negativity that can drag on productivity. 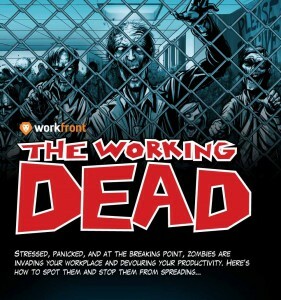 Click on the image to open the Workfront slide show and read about Workplace Zombies. Who knows? You might just spot someone you know! All the best, as we launch ourselves into the Holiday Season with a little Trick or Treat!